A LED matrix message display board that can be programmed from anywhere at anytime through SMS. Simply compose the message on any phone and send to a designated phone number and watch your message displayed immediately on the LEDs. 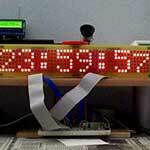 The project makes use of a GSM module and a Microcontroller as well as a LED dot-matrix display and other components. Microcontroller code is written in assembly for fast performance and high optimization.